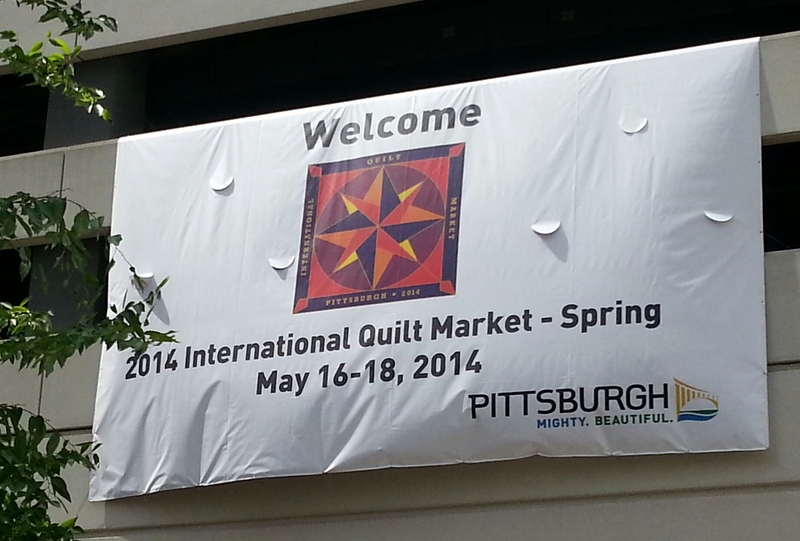 Spring Quilt Market was stimulating and exciting. 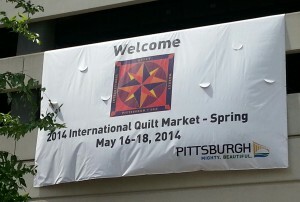 Downtown Pittsburgh is pleasant and the David L. Lawrence Convention Center is spacious and an ideal spot for the 500+ booths. 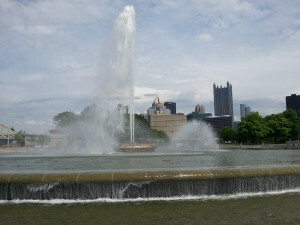 I stayed in the Omni Penn Hotel which is a fine building and the accommodations were very comfortable. 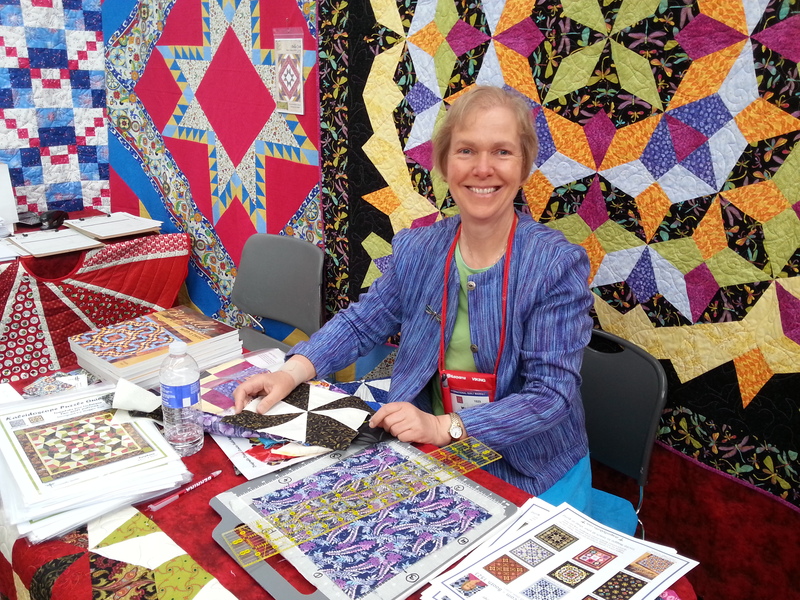 My roommate was Catherine Redford who was my host when I lectured and taught at her quilt guild in Naperville just outside Chicago a couple of years ago. 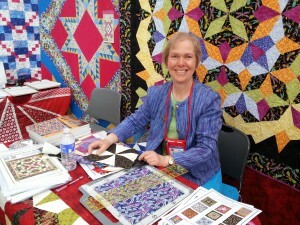 It was fun to see her again and catch up with her teaching activities including TV work. The logistics of setting up all the booths are staggering and it’s amazing to watch it all going up during the couple of days before the exhibits open. Some of the booths are very elaborate and require all kinds of props and supportive structures. 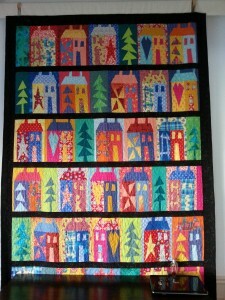 There are fork lift trucks, containers, rolls of carpet and all kinds of activity. The Schoolhouse presentations were during this time and held upstairs where there was a passage with windows overlooking the main exhibit hall. Here it is during set up. 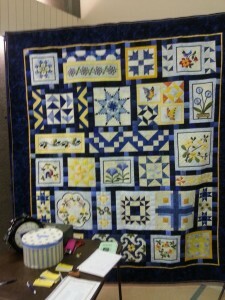 The Schoolhouse presentations were inspiring. 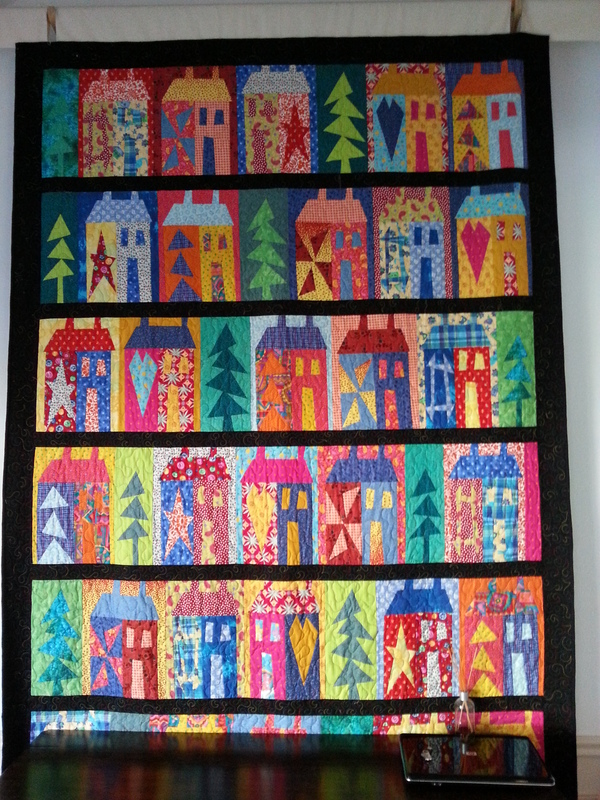 I loved these colorful vibrant quilts by Barbara Persing and Mary Hoover of Fourth and Sixth Designs, all made from Island Batik Fabrics. My presentation on my template-free Kaleidoscope technique was rather late in the day, but was well attended and I was delighted to receive some very positive feedback afterwards. Here’s the QuiltWoman.com booth, Nancy Dill our fearless leader with the worker bees and me at my demo spot. 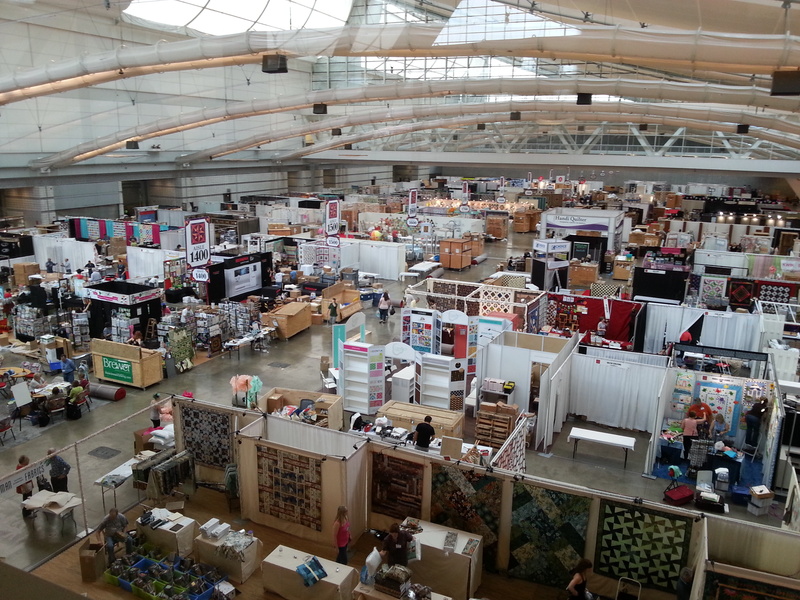 I spent each morning at market in the booth and then had some time in the afternoons to explore the other exhibits. At the end of April, I traveled to TX to teach at the New Braunfels Area Quilt Guild. There was a beautiful sampler raffle quilt displayed at the meeting in the spring colors of blue and yellow.This was made by guild members of the Hill Country Quilt Guild of Kerrville. 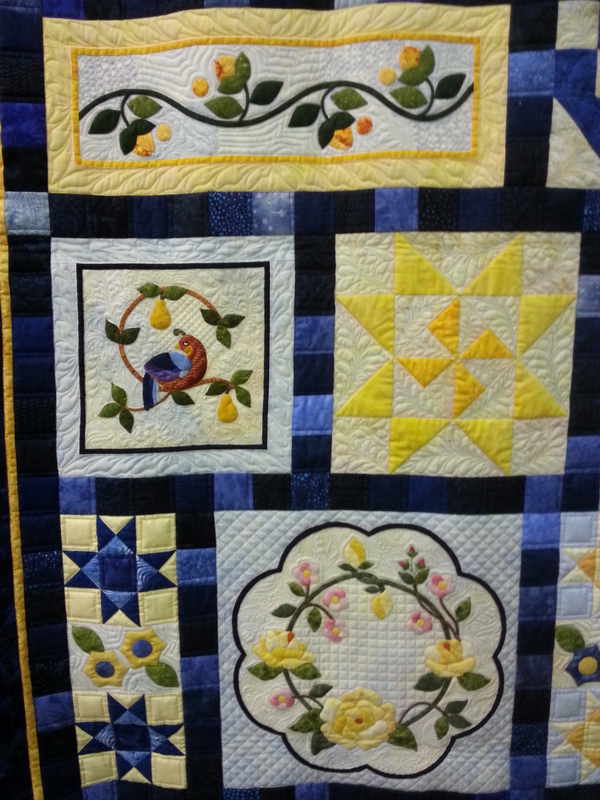 I love the array of different blocks both pieced and appliqued and how well they are all pulled together with the sashing in a variety of shades of blue. Here’s another opportunity quilt that I saw when I visited the quilt shop, One Quilt Place in Fredericksburg in the Texas Hill Country. 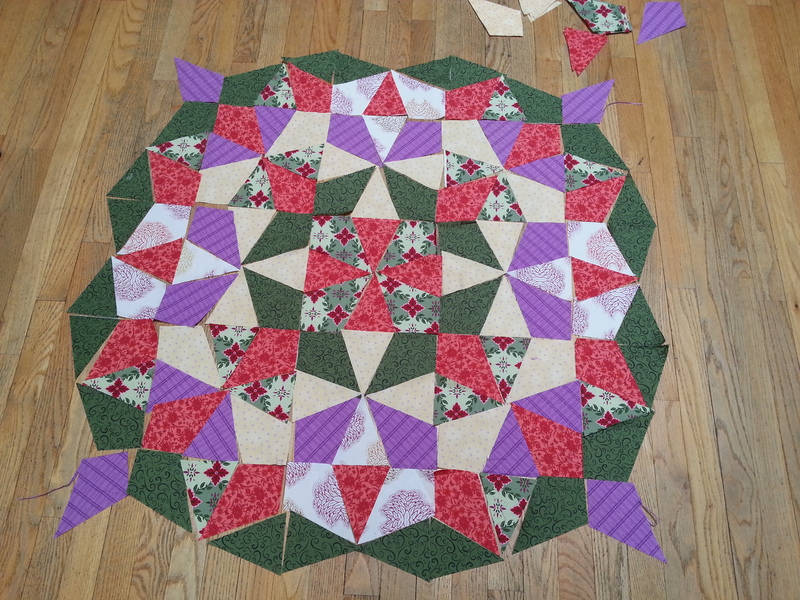 This gorgeous Feathered Star quilt in reds, yellows and greens is completed with an exquisite appliqued border. 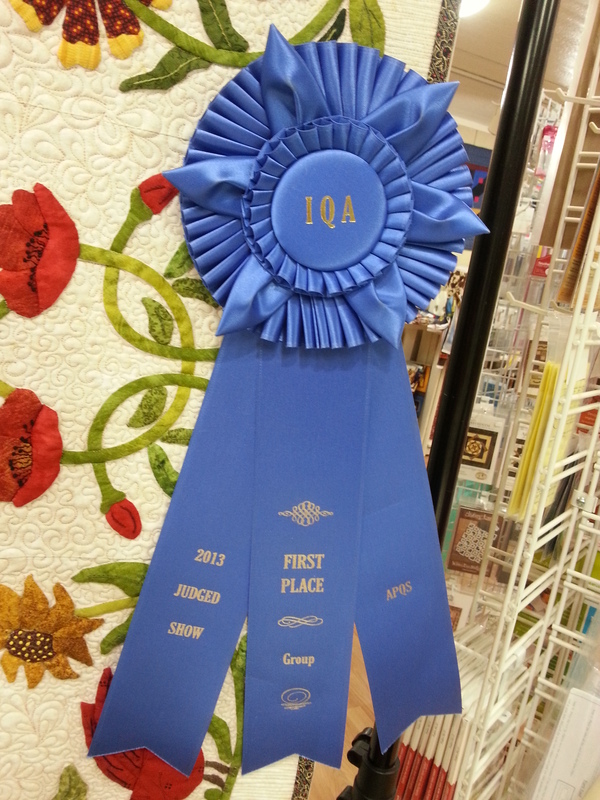 It was an award winner at the last International Quilt Association show in Houston, taking first place in the group category. 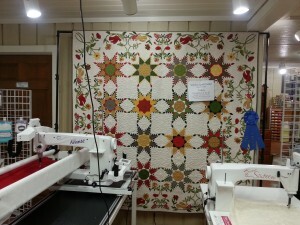 The quilt was made by members of the Vereins Quilt Guild in TX. 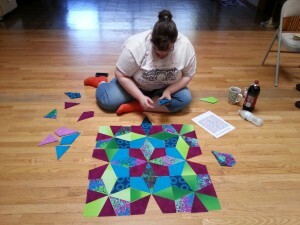 I’m a softy when it comes to these quilts and I always support the guilds who make them. I’ve never won one, but I really appreciate all the effort that goes into making them. 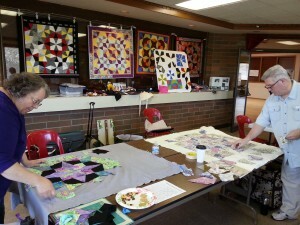 They often rise well above the average quilt made by individual guild members, not just in design, but also in workmanship. I encourage you to donate to these projects whenever you have the opportunity. 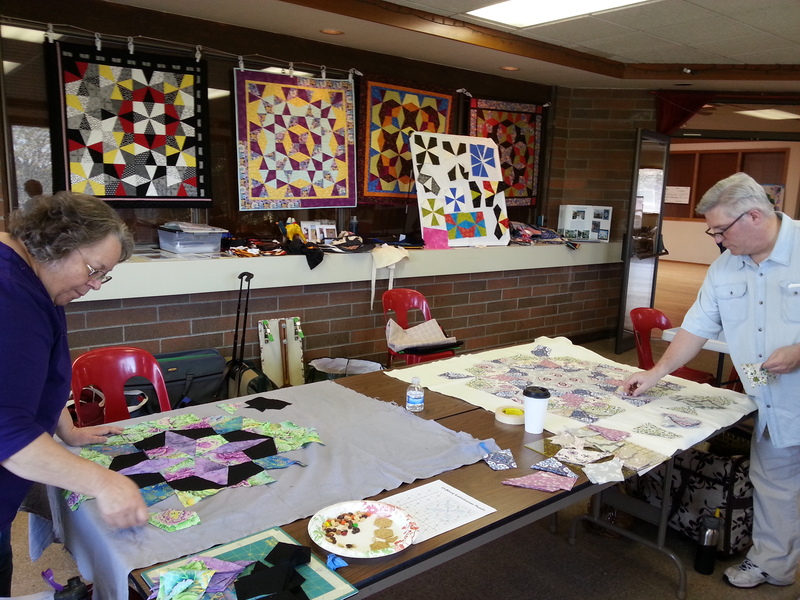 When I taught for the Crazy Quilters in Federal Way, I was fortunate to have a delightful overnight stay with one of the guild members, Eileen Peacher, in Puyallup. 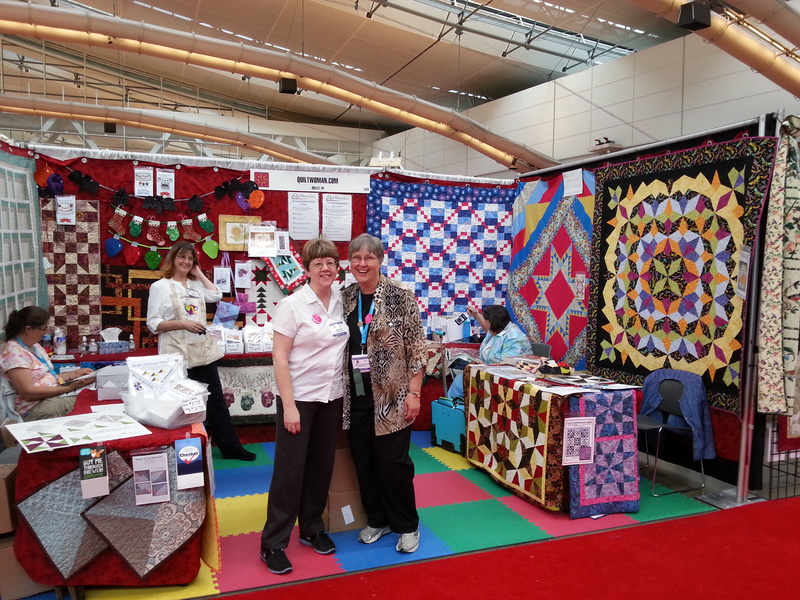 It’s always inspiring being with quilters and seeing their lovely quilts. Eileen has a long-arm business. 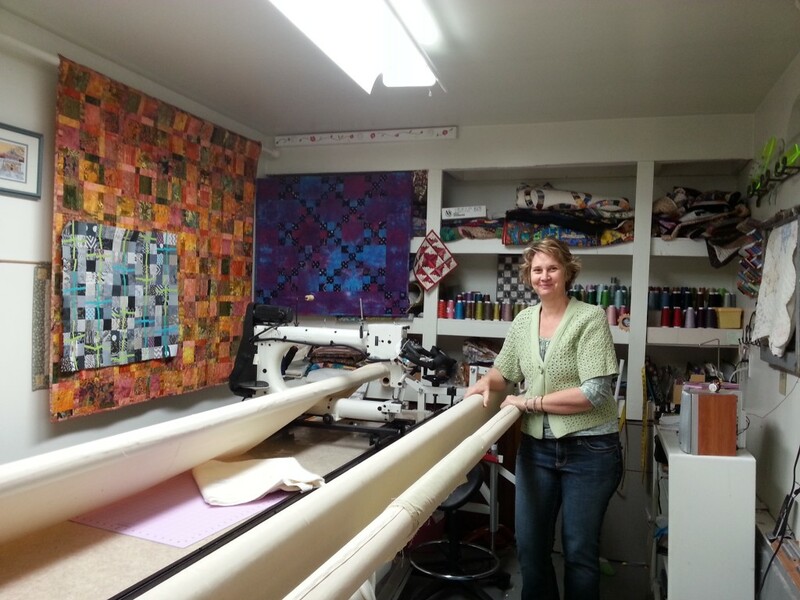 Here she is in her long-arm room which was carved out of the back of her garage. 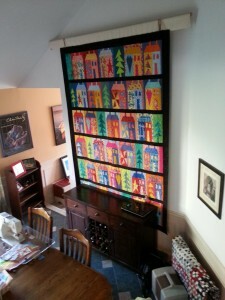 Her home was decorated with her vibrant quilts. 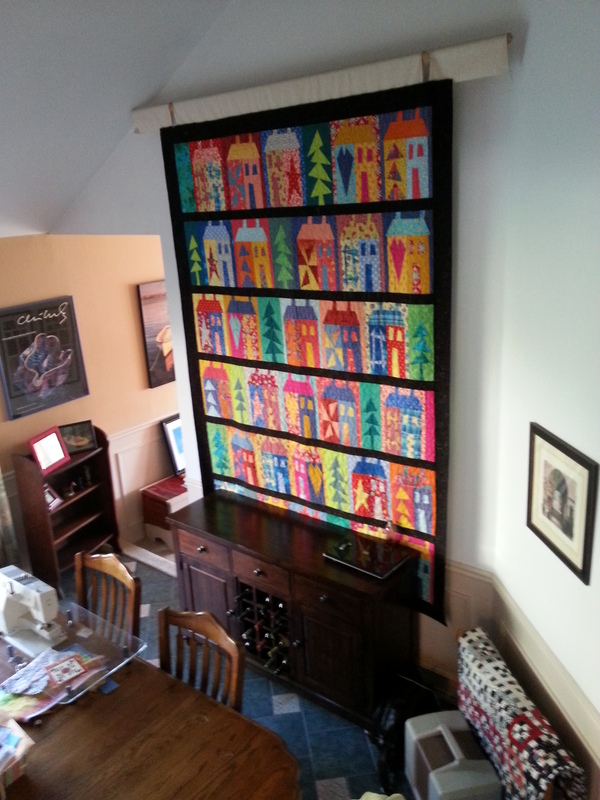 This large quilt with funky whimsical house blocks hung on a really tall wall in her dining room and was such a bright and cheerful accent. 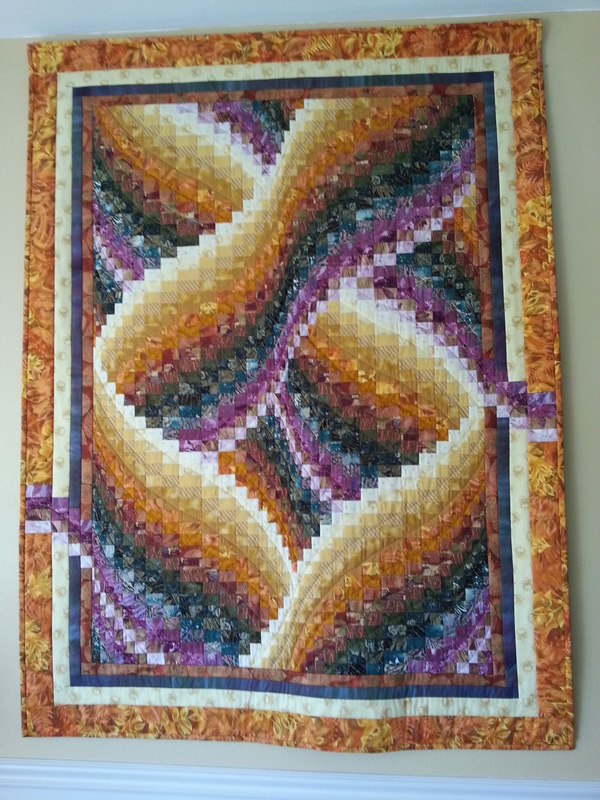 The living room was decked with this rich Bargello quilt. 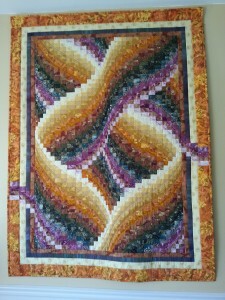 I love how Eileen continued some of the Bargello piecing out to the sides adding fluidity to the design rather than just simply framing it with solid borders . 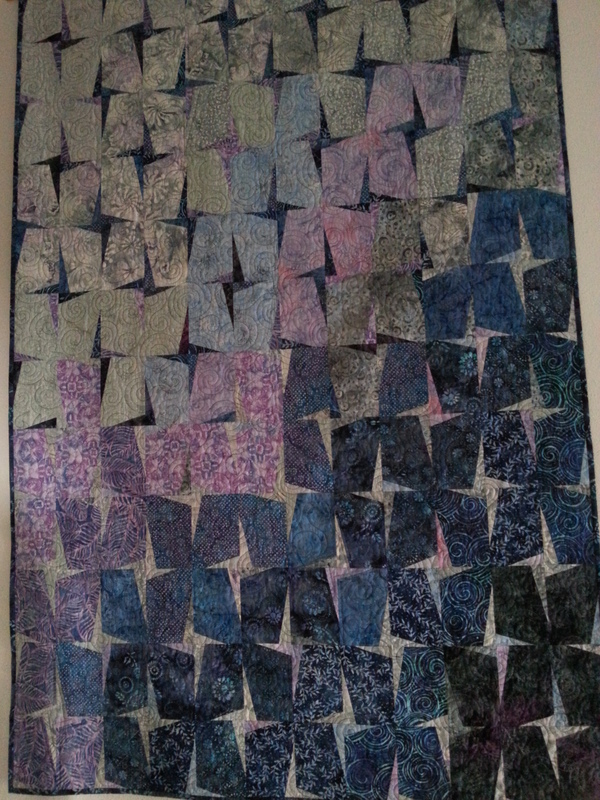 Hanging in the upstairs hall was this rather more muted quilt with nice color and value transitions and the light and dark thin sliver stars giving contrast with the background fabrics. 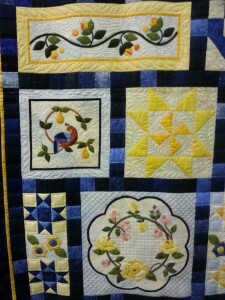 Thank you Eileen for a very enjoyable stay and for allowing me to share your beautiful quilts. 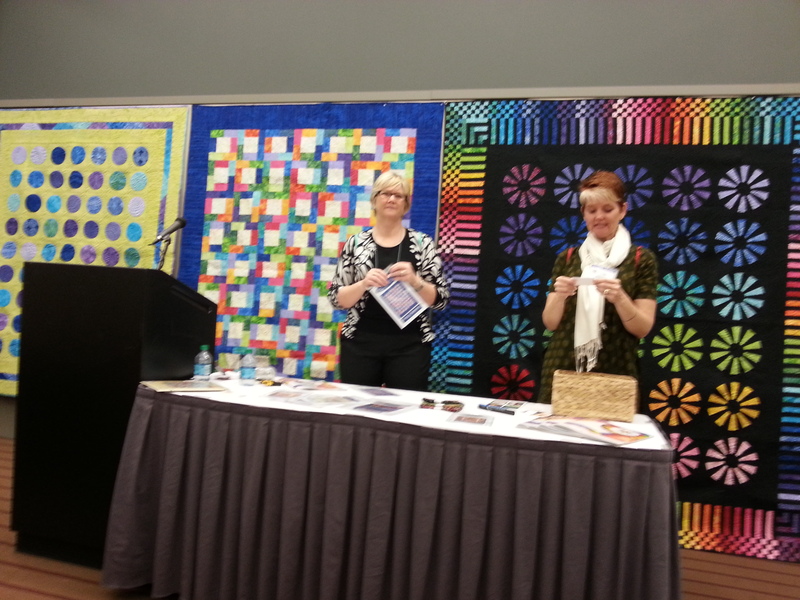 I recently taught and lectured in Federal Way for the Crazy Quilters. 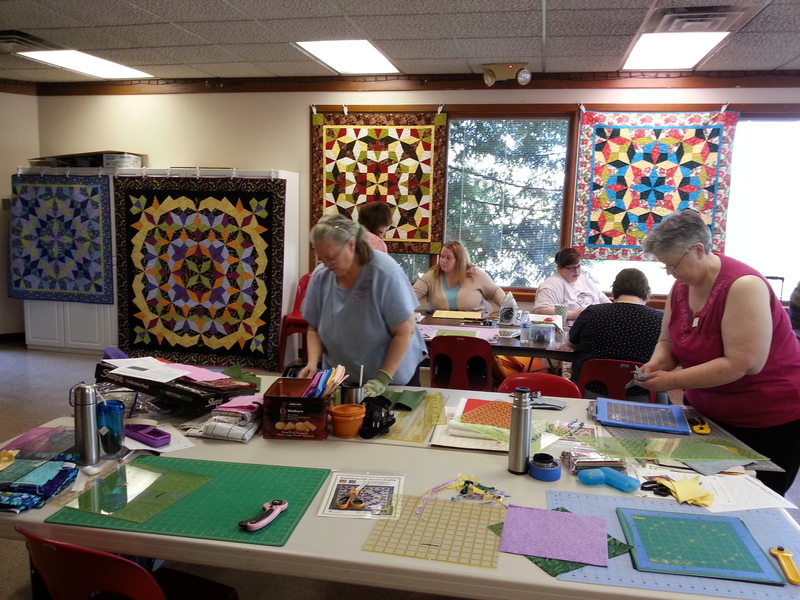 We had a half-day Kaleidoscope Puzzle Quilts class and my students had enough time to cut out plenty of kites and wedges and then play with their design layouts. 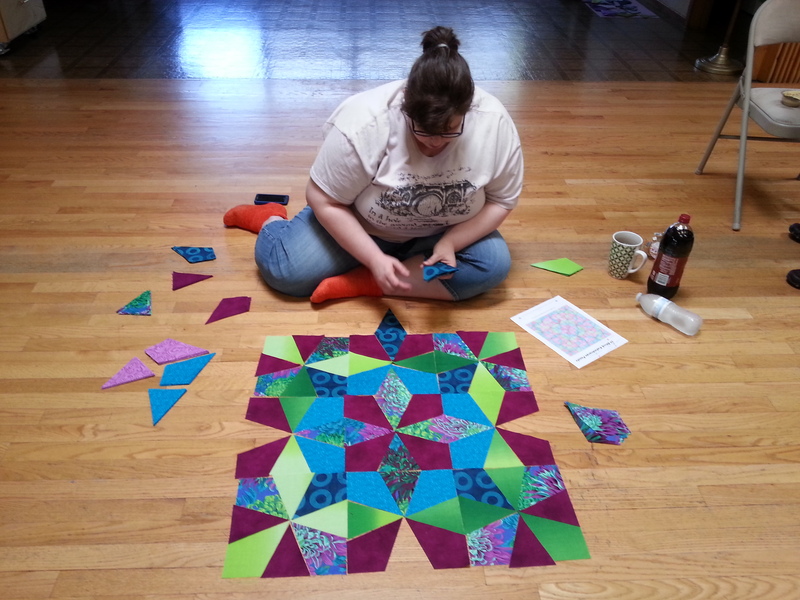 There was a large hall adjacent to the classroom, so when it came to designing, some of my students moved in and spread out their pieces on the floor. It was so much fun seeing the patterns come alive. 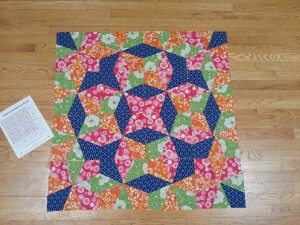 The value placement and fabric make such a difference and we had a great variety. 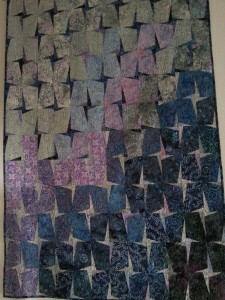 The students learnt a great deal and were inspired by looking at other student’s choices and making layout suggestions. 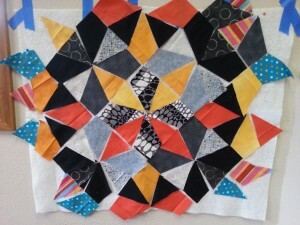 These traditional Kaleidoscope blocks can take on quite a contemporary look like this black and orange on-point example.